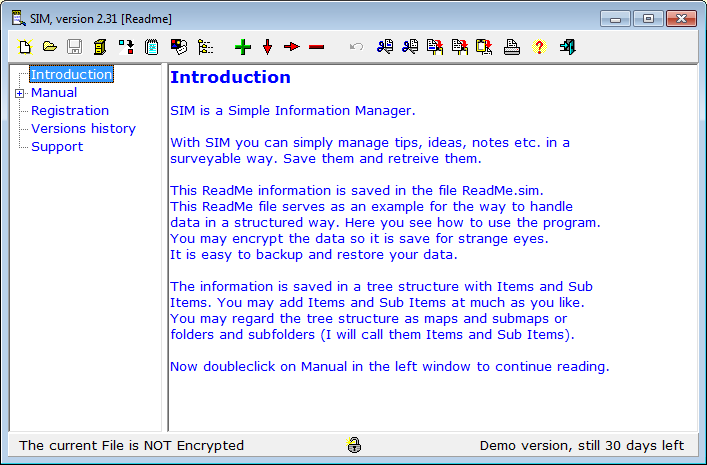 Store all your information and easily retrieve it with SIM; <br>SIM uses a tree structure to create order in your notes, ideas, addresses, <br>URLs, hints, tips, etc. <br>Full context sensitive Help is available. <br>The SIM window is divided into two parts, left the tree structure, right <br>the contents of one item of the tree. <br>Simply create new items and sub items, cut and paste to newly created items and drag them to a different place in the tree.